I first saw these little pigs in 2002 at the Topsfield Fair. It was a school field trip (my first as a paid teacher) and my co-teachers told me to make sure that I didn't miss Robinson's Racing Pigs. We got there 20 minutes early, ate our lunches while we waited and I wondered what was so special about racing piggies. Then the theme song started, a catchy little song which you just can't help but clap or sing along to. The pigs race for Oreo cookies and there is even a race where they swim to the finish in a small pool. 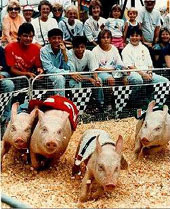 It is a lot of fun, they do a great job getting the crowd involved and for the next 4 years, my field trip groups never missed those racing piggies! This year was the first time in 6 years that I had been back to the fair. Ironically it was the same day that my old school was doing their annual field trip :) A few weeks before the fair, I showed Z and Lil'C videos on You Tube of Robinson's Racing Pigs. One look and they were hooked. Soon they were singing the theme song and couldn't wait to see the live event. The entire way to the fair you could hear "Robinson's Racing Pigs...." being sung from the back seat. As soon as we got through the fair gates, they demanded to go see the pigs. I explained that we had an hour before we should head over but they needed to see the race track NOW ;) We headed over, scoped out where we would sit and then went to visit the Bees, Sheep and other Pigs. The entire time I heard, "Mommy, is it time??". We got to the grandstand, ate our lunches and my kids could not contain their excitement. When the theme song started up, Z sang right along and hugged me as he did so. "Momma Racing Piggies, Robinson's Racing Pigs" Lil C said over and over. They were ready!!! When the pigs came out, they cheered them on and laughed as they raced. They were undecided whether they liked the swimming potbelly pigs or the tiny piglets best but agreed it was their favorite part of the fair. $2.25 for a ride ticket??? Seriously, this is the only ride they did. Biggest Pumpkin EVER, from RI...2009 Pounds!!!! "When we come back next year, let's bring Daddy!" Z said. "He needs to see these pigs!!!" At home Z raced around the house singing the theme song and Lil'C found her pig stuffed animal and curled up with it for nap time and said, "I love Robinson's Racing Pigs". It was a great day at the fair and those loveable pigs stole the show!!! I want to see the pigs!